I thought I would write down a few thoughts on the markets, specifically macroeconomic themes. For those who have read this blog for any amount of time will understand that I am quite worried about the collapse of the commodity bubble. I know some disagree that we are in a commodity bubble and that is fine. China, a huge consumer of commodities, has started to falter lately and GDP growth estimates keep falling. The housing bubble in China has recently collapsed. That will lower demand for all commodities. Goldman Sachs just issued a warning regarding Chinese growth as well. For a refresher I would suggest reading the comments from Prem Watsa on China/Commodity bubble that I posted earlier this year. Much of what he has said is starting to come to light today. I believe Canada, Australia, and most of the mining sector is in for much harder times. This isn't really surprising given the record high profit margins all these commodity companies have enjoyed for the past several years. A number of companies such as BHP Billiton, Rio Tinto, Teck and others have recently issued warning about falling demand. As for positives here in Canada I don't see much. I own a select few stocks from Canada and could generate a solid list of short candidates, starting with the banks. US homebuilders and Mortgage Originators are good bets. The sector is going to have nothing but a tail wind behind it going forward. I own the largest mortgage originators in the US and one of the largest homebuilders. I like the US banks and I would sell the Canadian Banks. The US banks have strongly recapitalized themselves and could suffer huge losses before running into trouble. I know most people shy away from the sector because the financial crisis is fresh in their mind. That is perhaps the biggest reason for bargains to be found in the sector. On the other hand, the Canadian banks sell for much higher valuations and are loaded up of over-leveraged Canadian consumer debt, some worse than others. The graph below makes this point rather clearly. 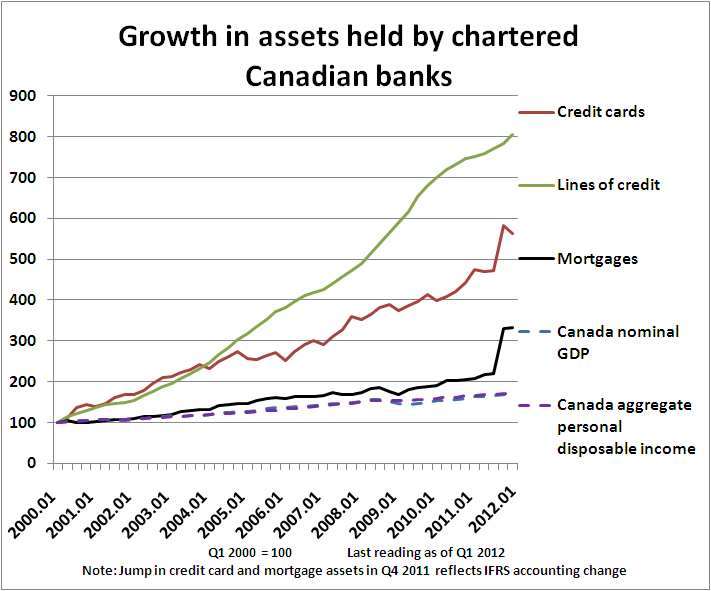 The problem is that Canadians have been using their houses like ATM machines, much the like the US did in the run up to their correction. In the US, home equity withdrawls peaked at 8-9% of personal disposable income in 2006. Here in Canada we apparently didn't get the memo that this is a problem and is not sustainable. 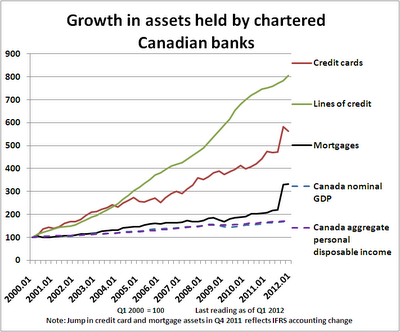 Since 2006, Canadians have been using their home ATM at a rate 8-9% of personal disposable income. That will end... and it will end badly for our economy. South of the border the US real estate markets appear to be on the mend. Housing prices have bottomed and most regions are up marginally. This bodes well for the healing necessary in the housing market. As Warren Buffett has said, the unemployment rate will fall dramatically once the housing sector begins to rebound. As noted in my previous post, natural gas is at very low prices and that is showing up strongly in the reduction in drilling. Investing in any commodity that is selling at prices below the marginal cost of production is always a good bet to take. I own the lowest cost explorer and producer of natural gas in Canada. One theme I particularly like but haven't actively invested in would be companies that buys commodities and sell a brand. These companies are the most likely beneficiary of lower commodity prices as margins are likely to expand in the short to medium term. If you have any suggestions feel free to email ("contact" tab above) or add your comments below. I think insurance companies are a good bet as interest rates rise. That said, I don't expect interest rates to rise any time soon. The debt deleveraging process has only begun and I believe we are in the midst of a debt deflation period. As for stocks that I believe are cheap, Fairfax Financial (FFH) just hit a 52 week low this past week, JP Morgan (JPM) is a no brainer with an easy 20% upside from here even in sideways market. Magna International (MG) appears quite cheap and auto sales are on the rebound. General Motors (GM) looks interesting as cash on the balance sheet almost equals its market cap. A number of technology names look cheap such as Dell (DELL) and Intel (INTC) now that the stock has come down again. I have mentioned Speedway Motorsports (TRK) here before and now the the stock has come down again I think the price is reasonable. I have looked into at least 30 small caps over the past month and haven't found anything to get excited about (mostly in Canada). I believe most small caps to be overvalued at this point in time because of the fragile nature of the economy. With so many cheap, high quality, large caps available today I don't see much reason to look elsewhere. Many of the large caps have strong balance sheets, can and have been issuing debt at record low interest rates recently, and can weather any storm in the economy much better than smaller competitors. So far, year to date, my portfolio is soundly outperforming the S&P 500 and trouncing the S&P/TSE index. Because of the strong markets, I am in the process of reducing most of my holdings and keeping the proceed in cash. That said, I don't tend to make wide changes in my portfolio and this year I have only made a few select purchases. I will be looking at short ideas for Canada in the near future. Suggestions always welcome. Disclosure: I am long FFH, and JPM TARP warrants. Kevin, there are very few good Canadian blogs talking about companies they like and why they like them. I really value the content you put up. Keep the ideas coming. And there is lots of value to reading a blog poster I respect, making the conviction of buying the company and posting that he is doing it. Please continue to let us know when you have such strong convictions in a company to make the purchase. GM has liabilities (net of cash) that far exceed it's market cap (net debt to equity at 3x). Definitely a levered play on the auto sector. Until the government liquidates it's position, there will be an overhang on the stock and it will appear cheap. Auto lending standards have loosened, but GM continues to build inventory. I'm not sure it's the top of the cycle at the moment, but 80+ days of saleable inventory at the end of August is not a good sign. Magna, that might be a good call. Healthy dividend, cheap on earnings, very clean balance sheet. Plus, they got rid of Frank! Dell can't compete with the Asian manufacturers like Lenovo, it's the next HP. Intel might be a good call. Chip demand should pick back up if Windows 8 is a success. I'm not American, so I can't tell you if stock car racing's popularity is waning or not. But I can tell you that their core demographic keeps getting poorer, and rising crop prices is going to make their beer more expensive next year. As a value investor, what do you think of Gerdau SA (GGB:NYSE)? South America steel company based out of Brazil. Trades far below it's book (and replacement) value. With Brazil having announced bidding on a number of infrastructure projects for the Olympics/World Cup drive, it should earn well over the next couple of years. I wouldn't touch GGB. I took a quick look and it doesn't sell below book value. I would convert your brazilian real to USD correctly. After a quick look at the balance sheet, I may be interested at USD $4 per ADR. That said I wouldn't touch anything that smells of a commodity until the commodity bubble unwinds.